The world online premiere of the short film Evidence on Constellation.TV on February 2 at 8 PM will allow viewers to interact with each other along with the filmmakers while they watch Evidence in real time. Jan. 24, 2012 - PRLog -- Mark Lund, Executive Producer, and Jessica Killam, Producer, are pleased to announce the world online premiere of Justice Is Mind: Evidence on Constellation.TV on February 2 at 8:00 PM EST. Billed as an online movie theatre, Constellation.TV is a social experience that allows viewers to invite friends to watch with them online where they can interact with the films directors and actors. Justice Is Mind: Evidence is the first short film to be featured on Constellation.TV. Founded in 2011, Constellation.TV [http://www.constellation.tv/film/102#p=1] operates just like a traditional movie theatre but online. Audiences purchase tickets to attend scheduled showtimes of movies or create their own showtimes to watch when they want. Unlike other online platforms, watching movies on Constellation.TV is a social experience - users can invite their friends to watch with them, and can interact with VIP hosts, such as the films directors or actors, who often appear live to answer questions during and after select showtimes. “Constellation is excited to be working with the Justice Is Mind: Evidence team on helping them bring their film directly to their audience via the constellation platform,” said Darcy Heusel, Director of Programming, Constellation.TV. In Justice Is Mind [http://www.imdb.com/title/tt2117894/] MRI technology has advanced to a point where imaging of long term memories can be produced in near video quality. When local businessman and restaurant owner Henri Miller has the new FVMRI scans and it reveals him murdering two contractors on his property, the first Superior Court trial begins in which a defendant’s own memory can be introduced as evidence. Evidence begins in the chambers of Judge Richard Wagner when motions are presented by Henri’s defense counsel in a desperate attempt to suppress the key memory evidence of the alleged double murder. The story continues at the Miller residence with Henri growing more unstable and his journalist wife, Margaret, attempting to bring some normalcy to their situation—a futile attempt when the news of Henri’s fate is broadcast to the world. The short film version Evidence was produced to introduce the concept of Justice Is Mind and to act as a capital raise vehicle to produce the feature length version. In concert with the producer’s capital raise activities, the production has launched a crowdfunding campaign on IndieGoGo to further interest in the project [ http://www.indiegogo.com/Justice-Is-Mind]. Justice Is Mind: Evidence stars Vernon Aldershoff (Henri Miller), Alexander Cook (John Darrow), Maria Natapov (Constance Smith), John Depew (Judge Wagner), Robin Rapoport (Margaret Miller) and Toula Coin (News Reporter). The film also introduces Joshua Hey (Brian Miller) and Kim Merriam (Court Stenographer). 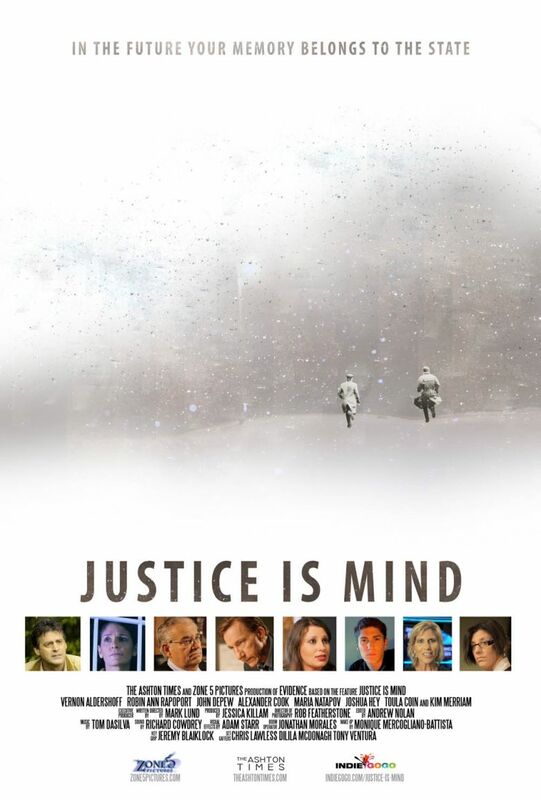 Tickets to the online premiere of Justice Is Mind: Evidence are $2.99. However, audiences that “Like” Constellation.TV on Facebook at checkout will receive an additional $1 discount for a reduced ticket price of $1.99. Jess Killam is currently a Junior attending Fitchburg State University for video production. She has produced student films and done various other crew work on films from Emerson College and Fitchburg State as well as stage managed numerous plays. She had her stage directing debut this past December with Brilliant Traces. She also serves as assistant director for Justice is Mind: Evidence.